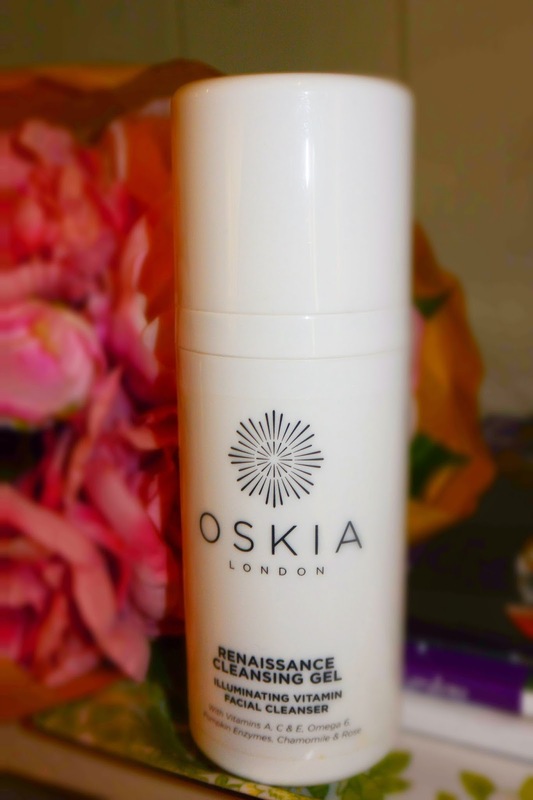 I mentioned that I'd picked up the OSKIA Renaissance Cleansing Gel in my Space NK haul a while back and a few people were keen to see the review of this one, It's definitely starting to get a name for itself and rightly so, when I was looking to revamp my skincare routine, this is the main thing I knew I wanted, I first saw it on one of Vivianna Does Makeup's vlogs I think and ever since then I've spotted it popping up on several blogs and I've been lusting after it ever since. This leaves my skin feeling amazing, it says cleansing gel, which it is, it's a soft pink gel but it definitely leans towards an oil texture as well as you massage it in, it melts onto your skin much and starts working on breaking down the makeup much like a balm or oil would and as you massage it in, you start to get the scent coming through which is so beautiful, it's like a rose dream, I find strongly scented products can sometimes irritate my skin but there were no issues with this, I actually think because of the ingredients in this, it's incredibly calming and soothing for my skin. So, I pump this out, about a pump and a half works for me, I start massaging it in, it works really well on waterproof mascara, I normally take my eye makeup off with a micellar water before cleansing but there were several times over christmas where I just used this and I just tended to massage it in and it takes away all my mascara. Anyway, I get it all over the face and actually leave it on for a minute or so while I get a hot flannel ready and then take it off, all my makeup comes off and I've tested with a toner afterwards, there's nothing left but the main thing that separates this from an oil or balm I found is that there's no residue left on my skin afterwards but it still feels amazingly moisturised but really clean, I love oils and balms for taking off makeup but I hate that layer it leaves. The packaging on this is brilliant and I wish all cleansers would come like this, it's a sturdy plastic, nothing special on that front, looks nice though, but it's the pump that works with this, so many cleansers come in pots or tubes and you have to mess around with trying to get lids off, squeezing product out, all while your face is soaking wet and you can't open your eyes so you end up squeezing too much out or my favourite, dropping the lid down the sink hole which has happened to me way too many times, this is just a simple pump but it makes such a difference to getting the product out and makes the whole process a breeze. Possibly a little bit of a dramatic rant there but I'm sure some of you feel my pain there. It's not the cheapest cleanser in the world but skincare is where I'm kind of OK with splurging, it's £28, I picked mine up from here. 4 comments on "REVIEW // OSKIA Renaissance Cleansing Gel"
This sounds lovely it's definitely on my list of things to try!